The patient was born in 1995. A long-term mass in the soft tissues of the right thigh’s medial upper part. During 1,5 months was followed up treated with traditional (folk) medicine and physiotherapy in a private clinic. At the admission the patient had a large tumor node in the above-mentioned location with deep growth, compression surrounding tissues and skin necrosis. 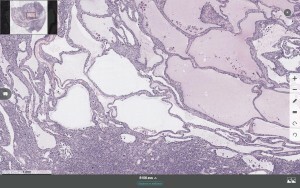 Metastases in regional lymph nodes were revealed. Lymph node excision biopsy is available for discussion.